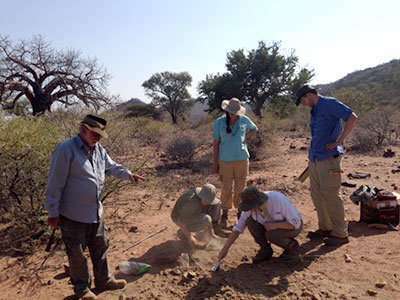 Using new data gathered from sites in southern Africa, University of Rochester researchers have extended their record of Earth's magnetic field back thousands of years to the first millennium. "We've known for quite some time that the magnetic field has been changing, but we didn't really know if this was unusual for this region on a longer timescale, or whether it was normal," says Vincent Hare, who recently completed a postdoctoral associate appointment in the Department of Earth and Environmental Sciences (EES) at the University of Rochester, and is lead author of a paper published in Geophysical Research Letters. In order to put these relatively recent changes into historical perspective, Rochester researchers—led by John Tarduno, a professor and chair of EES—gathered data from sites in southern Africa, which is within the South Atlantic Anomaly, to compile a record of Earth's magnetic field strength over many centuries. Data previously collected by Tarduno and Rory Cottrell, an EES research scientist, together with theoretical models developed by Eric Blackman, a professor of physics and astronomy at Rochester, suggest the core region beneath southern Africa may be the birthplace of recent and future pole reversals. "We were looking for recurrent behavior of anomalies because we think that's what is happening today and causing the South Atlantic Anomaly," Tarduno says. "We found evidence that these anomalies have happened in the past, and this helps us contextualize the current changes in the magnetic field." The researchers discovered that the magnetic field in the region fluctuated from 400-450 AD, from 700-750 AD, and again from 1225-1550 AD. This South Atlantic Anomaly, therefore, is the most recent display of a recurring phenomenon in Earth's core beneath Africa that then affects the entire globe. 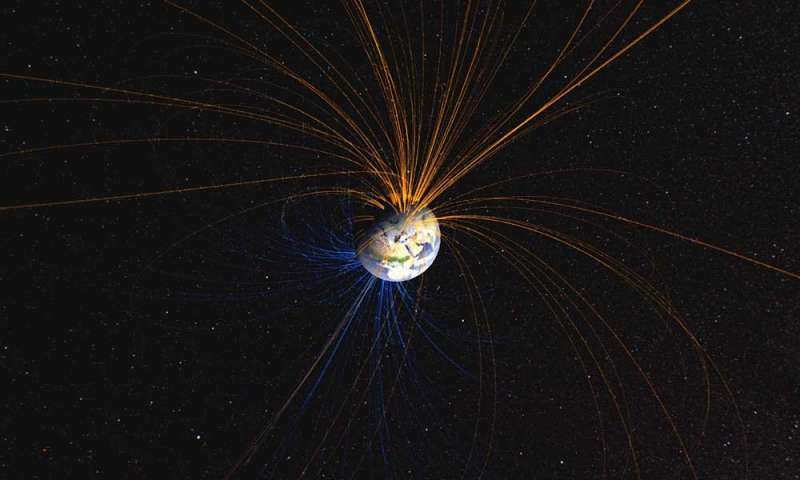 The magnetic field is generated by swirling, liquid iron in Earth's outer core. It is here, roughly 1800 miles beneath the African continent, that a special feature exists. Seismological data has revealed a denser region deep beneath southern Africa called the African Large Low Shear Velocity Province. The region is located right above the boundary between the hot liquid outer core and the stiffer, cooler mantle. Sitting on top of the liquid outer core, it may sink slightly, disturbing the flow of iron and ultimately affecting Earth's magnetic field. "We now know this unusual behavior has occurred at least a couple of times before the past 160 years, and is part of a bigger long-term pattern," Hare says. "However, it's simply too early to say for certain whether this behavior will lead to a full pole reversal." Even if a complete pole reversal is not in the near future, however, the weakening of the magnetic field strength is intriguing to scientists, Tarduno says. "The possibility of a continued decay in the strength of the magnetic field is a societal concern that merits continued study and monitoring." The researchers gathered data for this project from an unlikely source: ancient clay remnants from southern Africa dating back to the early and late Iron Ages. As part of a field called "archaeomagnetism," geophysicists team up with archaeologists to study the past magnetic field. "When you burn clay at very high temperatures, you actually stabilize the magnetic minerals, and when they cool from these very high temperatures, they lock in a record of the earth's magnetic field," Tarduno says. Researchers excavate the samples, orient them in the field, and bring them back to the lab to conduct measurements using magnetometers. In this way, they are able to use the samples to compile a record of Earth's magnetic field in the past.